SEOUL (REUTERS, WASHINGTON POST) - North Korea's state media said on Monday (June 11) that its leader Kim Jong Un and United States President Donald Trump will discuss a "permanent and durable peace-keeping mechanism" on the Korean peninsula, denuclearisation of the Korean peninsula and other issues of mutual concern. Mr Kim and Mr Trump arrived in Singapore on Sunday for what will be the first-ever summit, set to held on Tuesday (June 12), between a leader of North Korea and a sitting US president. "Wide-ranging and profound views on the issue of establishing new DPRK-US relations, the issue of building a permanent and durable peace-keeping mechanism on the Korean peninsula, the issue of realising the denuclearisation of the Korean peninsula and other issues of mutual concern, as required by the changed era, will be exchanged at the DPRK-US summit talks," the Korean Central News Agency (KCNA) reported in English. The report also said Mr Kim was accompanied by his foreign minister Ri Yong Ho, defence minister No Kwang Chol and sister Ms Kim Yo Jong. KCNA noted that the summit meeting is the first in history between the two countries and will be held "under the great attention and expectation of the whole world". Mr Kim's itinerary was reported in detail, which is a rarity for the state's media, according to South Korea's Yonhap news agency. The Rodong Sinmun, the mouthpiece of the Workers’ Party, also featured his departure in a full-color two-page spread, declaring on the front page that he was leaving in a Chinese plane for a “historic summit” with the US president. 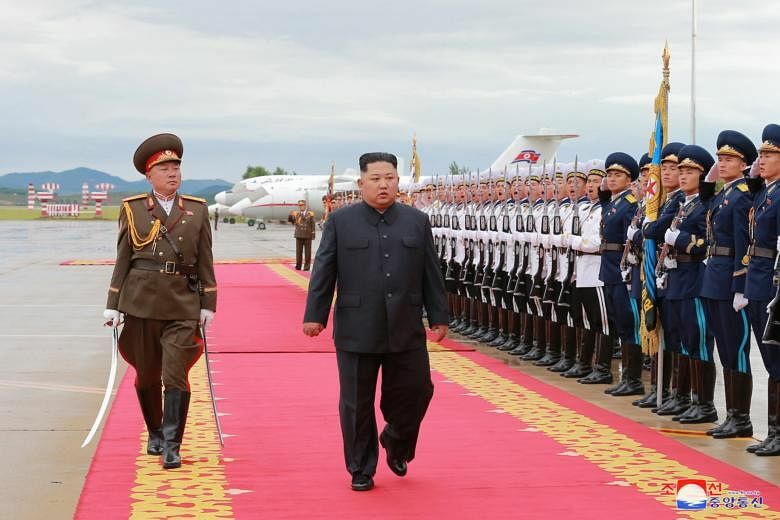 Mr Kim was sent off in a ceremony at the Pyongyang airport joined by a group of senior officials, such as Mr Kim Yong Nam, the North's nominal head of state, Mr Choe Ryong Hae, vice-chairman of the North's State Affairs Commission, and Prime Minister Pak Pong Ju. "The senior officials of the party and government sincerely wished Kim Jong Un good successes in the first summit meeting and talks between the DPRK and the US and his safe return," the KCNA said.